“The Watermelon” (2009) is a quirky little film written by Michael Hemmingson, directed by Brad Mays. Some of the Southern California characters have Greek names, as if there were some metaphor of Greek plays – okay, the story is a kind of “Odyssey in situ”. The title refers to a little red and green trailer (mobile home) which looks a bit like the summery fruit that often substitutes for dessert. Achilles Pumpkinseed (Will Beinbrink) is a mild-mannered but aimless young man who lives alone in a hand-me-down house (his deceased Mother’s) and runs what seems like a hand-me-down candy store business, but not well. One day, a visitor (“Homer”, Mike ivy) appears to tell him his stepfather left him this cute little trailer, which gets towed to his property. Pretty soon all kinds of visitors start showing up and crashing, putting Achilles into the limelight. The local free newspapers want to do stories about him, or about the Watermelon. We start learning more about Achilles’s own past, as his own life takes shape and as he cleans up his act. He becomes quite likeable as he asserts his libertarian "property rights". We learn about his previous marriage and divorce (with some question as to whether he really wanted children), and his stint as a law student. We get a sense that he is drifting because of some deep family hurt that needs forgiveness. Eventually, a vengeful sister (Kiersten Morgan) shows up, has him served at the candy store; when the probate judge sides with Achilles, the film races toward a somewhat violent but almost funny climax. Elyse Ashton plays two roles, the ex-wife and the hippy, almost homeless “artist”. A lot of viewers are surprised to find out that she plays two roles in the end credits. There’s a line early about how people who seek “power” don’t have “truth” – that seems to relate to Rosenfels (elsewhere in my blogs), but in Rosenfels’s books on psychological polarities, it’s “love and power” that are opposites (eg. Feminine and masculine), or, correspondingly, “truth and right”. The CW music score is by Peter Girard, but there are interesting classical excerpts, as with the opening scene showing the “hung over” stepfather Creon (Bob Golub), with Edvard Grieg’s “Morning” from Pier Gynt playing, and later a setting of some of Carl Orff’s Carmina Burana. The film has a female narrator as a “storyteller”, who talks with the style of Blake Lively in “Gossip Girl”, without the video blog. I think the narrator is Persephone (Kiersten Morgan). Istvan Criste and Michael Hemmingson (Facebook profile) co-produced the film. The DVD contains a featurette about the Making of The Watermelon, as well as optional commentary. In the featurette, Brad Mays mentions his film "The Trojan Women" (2004, Ark), based on Euripides. I have not seen that film, but I believe that I saw the play at the Circle in the Square off-off Broadway theater on a weekend visit to New York City in 1964 when I was 21 (to go to the World's Fair). I would live in New York after I "came out" from 1974-1978. This all comes back. 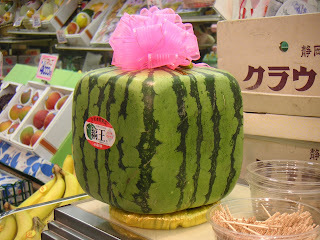 Attribution link for Wikipedia picture of a Japanese square watermelon, like the mobile home in the film.